GOODYEAR, Ariz. (AP) Jose Peraza is moving to his accustomed position at shortstop, a significant change in the Cincinnati Reds‘ lineup that will affect not only their up-the-middle defense but the top of the batting order. The 23-year-old infielder knows he’ll be in the spotlight all season. ”I like it,” Peraza said of the move. The Reds’ main focus in spring training is keeping their veteran starters healthy and getting Peraza settled in at one of the most important everyday positions. The rest of the everyday lineup returns intact. Zack Cozart was one of their best defensive players and one of their most reliable hitters the last two years. He didn’t fit into Cincinnati’s long-term plans and was allowed to leave as a free agent after his best season – 24 homers, 63 RBIs, a .297 batting average. He signed with the Angels, leaving the job open for Peraza. It’s taken Peraza a couple of years to get his chance. He was stuck behind Cozart and second baseman Brandon Phillips in 2016. After the season, they traded Phillips to open a spot for Peraza, who was acquired as part of the three-team deal that sent Todd Frazier to the White Sox after the 2015 season. Instead of Peraza taking the job full-time, the Reds gave Scooter Gennett an expanded role at second base. 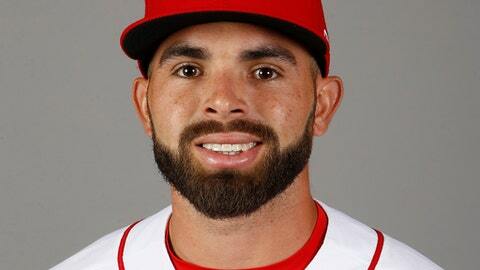 Peraza wound up starting 69 games at second and 48 at shortstop when Cozart was hurt or needed time off. Peraza batted .259 with five homers, 37 RBIs and only 20 walks, an indication of his lack of patience at the plate. Peraza improved as the season went along, batting .293 in the last two months. Cozart usually hit second behind Billy Hamilton. Peraza will bat much lower in the order, most likely seventh at the outset. ”The lineup is fluid at this point,” manager Bryan Price said. Peraza rarely walked in the minors. The Braves traded him to the Dodgers in 2015 as part of a 13-player deal also involving the Marlins. The Dodgers got starter Mat Latos from the Marlins as part of the deal. Cincinnati thought he fit with their rebuilding and got him after the 2015 season, knowing Phillips and Cozart were nearing the end of their careers with Cincinnati. Peraza played shortstop during winter ball in Venezuela, trying to improve his hitting most of all. He’s also been working in the batting cage. The Reds signed Cliff Pennington to a minor league deal earlier this month and invited him to camp, giving them a backup infielder. The starting shortstop job belongs to Peraza. ”I have a great opportunity,” he said.